Police: "Being found with people ... in possession of cannabis is a petty offense"
NAIROBI, Kenya (CNN) -- All charges against George Obama, half-brother to U.S. President Barack Obama, have been dropped after his arrest in a drug raid, according to police in Kenya. 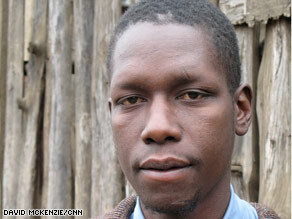 George Obama was arrested in Kenya on suspicion of marijuana possession, according to police. He was released on Saturday hours later, police added. Obama was arrested in a Nairobi slum, and he was picked up with people who possessed marijuana, said police spokesman Eric Kiraithe. "Being found with people who are in possession of cannabis is a petty offense," Kiraithe said. Earlier, police had told CNN that Obama had been arrested for possessing cannabis and resisting arrest, which can carry a sentence of up to a year in jail or hefty fines. "Police in Kenya do not look at criminals in light of associations with relatives," Kiraithe said. Obama and the president barely know each other, though they have met. George Obama was one of the few people closely related to the president who did not attend the inauguration in Washington. In his memoir, "Dreams from My Father," Barack Obama describes meeting George as a "painful affair." His trip to Kenya meant meeting family he had never known. CNN tracked down George Obama in August 2008 and found him at a small house in Huruma, a Nairobi slum, where he lives with his mother's extended family. His birth certificate shows he is Barack Obama's half brother. The two men share the same Kenyan father. In the memoir, Barack Obama struggles to reconcile with his father after he left him and his mother when he was a child. Barack Obama Sr. died in a car accident when George was 6 months old. And like his half brother, George hardly knew his father. Unlike his grandmother in Kogela, in western Kenya, George Obama received little attention from the media until reports about him surfaced in August 2008. The reports sprung from an Italian Vanity Fair article saying George Obama lived in a shack and was "earning less than a dollar a day." The reports left George Obama angry. Obama, who is in his mid-20s, said at the time that he was learning to become a mechanic and was active in youth groups in Huruma. He said he tries to help the community as much as he can.